In this article you will find the direction how to use all cyclical models that are present now in Timing Solution software. Right now the program allows to create practically all known cyclical models, starting from simple charting tools and ending with a special modification of the wavelet module. 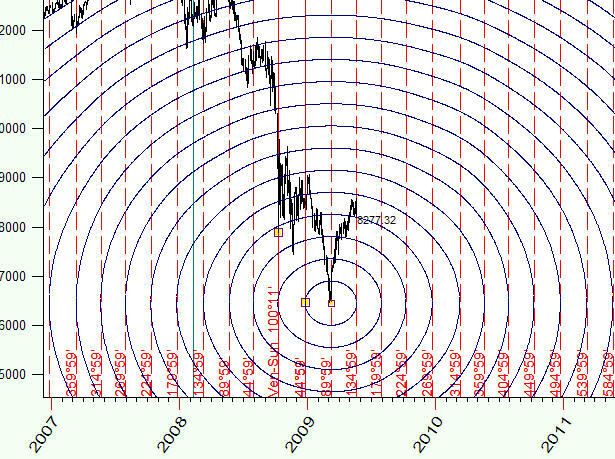 All cyclical models in Timing Solution were developed specifically for the stock market conditions. You will find below the description of these models as well as some useful hints. However, what this article is actually about is the information theory and its application to the stock market analysis. Creating models and testing different ideas, we try to understand the language that His Majesty the Stock Market uses to communicate with us - and with the world. This is the focus point for us, this is what we always look for, no matter what models or techniques are discussed. In this regard, the general idea of the cyclical analysis is very simple (and you will find it below), while the amount of possible variations of this simple idea is huge; and all techniques presented in this article serve this very simple basic idea, though serve it differently. Practically all techniques shown below can be used for any financial instruments and for any time frames. Some modules here represent very popular techniques, while others (like Turbo Cycles module) have appeared as the result of very exhausting procedure of walk forward analysis. 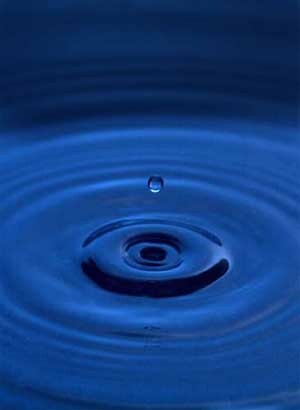 The article is organized from simplest and obvious methods to the more complicated ones. We start with charting tools - visual tools to catch important market events. Then other methods appear, as a logical answer to the questions that appear after each move. Let us start with the most used modules. So, having no intention or hidden agenda, I have downloaded the S&P 500 price chart, till the last price bar (December 2, 2011, because I have started writing this article on December 3). This is the piece of market information that we will work with. I guess this chart shows clearly the core idea of the cyclical analysis. The major bottoms since April 2011 are separated by very close distances - 59, 54, 56 and 59 calendar days. Some kind of a repetition is there. 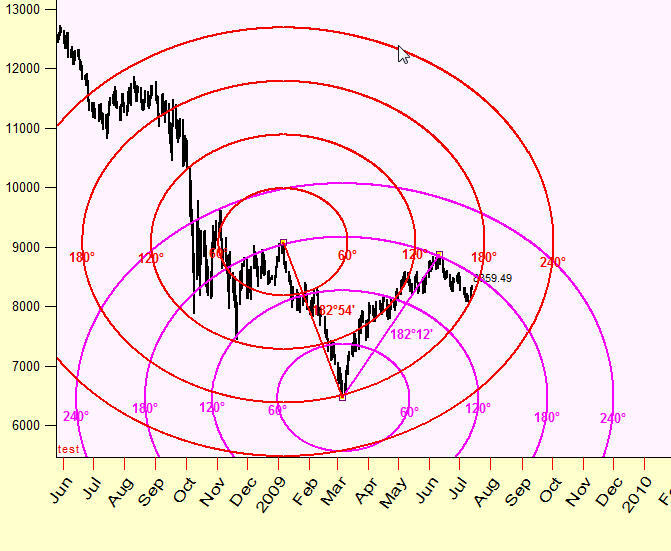 This is the most important insight of the cyclical analysis - a presence of regular patterns. It is enough for us as so far; we can work with this simple idea without involving any complicated math. We have now 41, 37, 39 and again 37 trading days. The difference between the longest period (41 trading days) and the shortest one (37 trading days) is still big enough: 4 trading days or 10% of the longest period. Our cyclical picture is still unclear, not precise enough, and we have to look for something else. In example above we used some artificial (human made) measure to count the distance between major turning points. Neither calendar nor trading days are good enough. What if some other ways of measuring that distance could be more helpful? Where can we find them? There are natural measures, and we can find these natural measures among astronomical phenomena. To calculate the distance between major turning, we can use not calendar or trading days, we can use the most natural measure - the traveling path of the Sun; this is the very natural clock used from ancient times. We can only speculate on the differences of these distances, like assuming that the shorter length of the swing of 51.33 degrees is caused by a sharp drop in July-August. In many cases the cyclical picture that was blurry when we have used a human-made measure (calendar or trading days) turns to be very precise and contrasting when we apply the natural metrics - astronomical metrics. The Sun cycle is not the only one that we can use. The same manner we can try other ancient "clocks" to count the distance - such as the Moon phases or planetary phases, or more complicated phenomena. So far we have restricted our research by turning points only. However, for real life trading we need to know more detailed information - to know how the stock market moves between the turning points. In other words, we would like to know not only the period of the cycle (the frequency of the repetitions), but the waveform that fits between those turning points. Assuming that such waveform exists, we may apply some charting tool based on it. In order to find a waveform that fits the best way to the stock price chart, there are several charting tools in Timing Solution. You can play with all of them to figure out how they fit your financial instrument. Try different waveforms till you find the one that fits your price chart well enough. As you see, all these charting tools are prolonged into the future; these are forecasting tools. When you apply Fourier string charting tools, try to play with the amount of overtones parameter to get more or less detailed waveform. 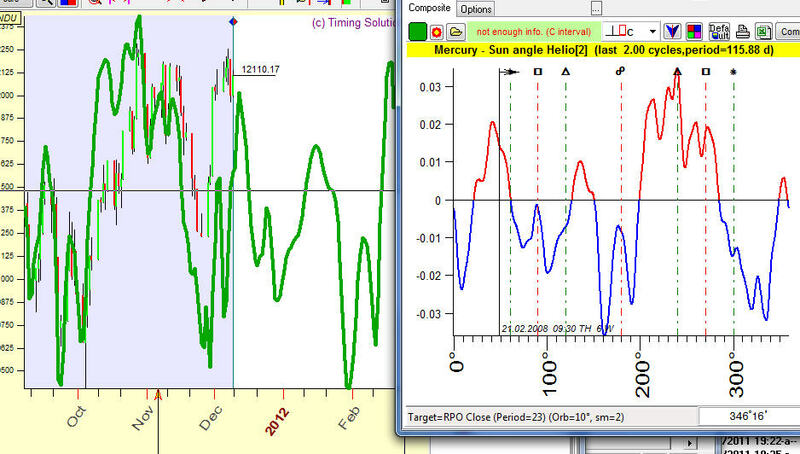 The peaks on this diagram correspond to the periods of the strongest cycles that are presented inside the data. 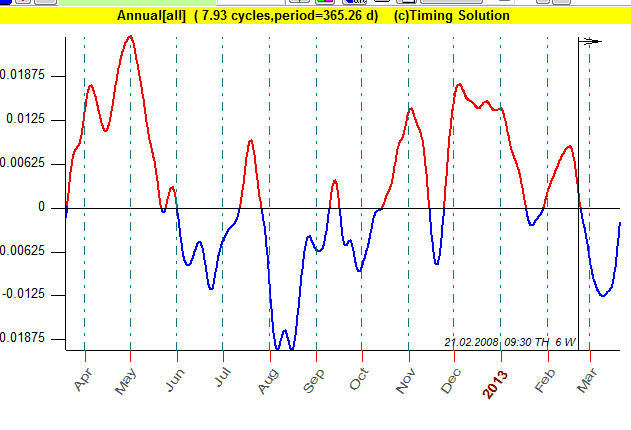 In our example the strongest cycles are 51, 95 and 150 days cycles. Step #6: what metrics to use? Doing real time trading, we usually have no time for detailed analysis on the spot. Some homework - definitely, yes. Considering one, then another, and one more tool - definitely, no. The decisions should be made quickly. It is understandable that we would prefer to have some easy-to-use models. Turbo Cycles module has been developed with this purpose in mind. In spite the fact that a very complicated math is used to calculate, extract and sort the cycles and then create a projection line, this module works fantastically fast. It works in real time without any delay. Here five of the most important cycles are revealed, and the projection line based on them is generated. Pay attention that cycles keep changing, there is no cycle that will be dominating for ever. Let us look back at the path that we went through. We have assumed that the cycles exist. We have started with the search of some repetitions inside the market data. We looked for different metrics. Then we have tried to reconstruct cycles that described the past market activity - just to be able to use these cycles for projection line's generation. After that we have looked for a way to define the most active cycles - just to avoid a process of the direct application of any cycle that we can think of. We have learnt to use single cycles and to combine them together. We have played a lot with different cycles. And now we came to the next set of questions - regarding cycles themselves. We used to look at the cycles as something established once - and forever. But why cycles that are the strongest ones at one moment do not keep their strength forever? Why we have different sets of the strongest cycles for the same financial instrument at different time periods? Our next step is the answer that we have found to these questions. The bright red spot there indicates that 117 days cycle is very active inside this time period. It has started to be active since mid of 2007 and disappears in the beginning of 2010. This diagram provides not only the information about what cycle is dominant at that period; it also gives us the information about the "age" of the analyzed cycle. The "old" age of the cycle (indicated by color) notifies that this cycle will stop working soon, and the models based on it have a strong chance to be not useful. As an opposite to that, we should keep our eye on the new born cycles - they give us a trading perspective. This is very important and very effective technique in Timing Solution. It is designed with the assumption that there are cycles in stock market activity and these cycles can be described the best as astronomy based cycles. This is a rather complicated module, so here we will not discuss it in details, only a short explanation will be provided. and many many other cycles. This module helps to select the cycles that have some relation to the market activity and therefore can be useful to generate a reliable projection line. In this module we employed Walk Forward Analysis (WFA) for cyclical analysis, and this is important because WFA is now a standard in financial industry. This module is very popular among TS users. 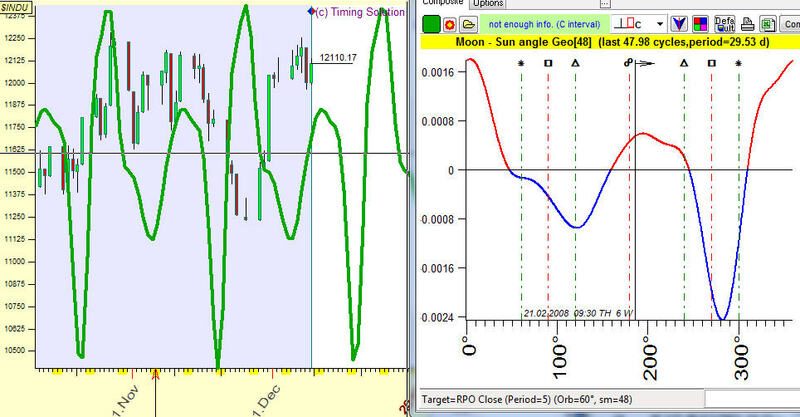 Right now Timing Solution covers the most important cyclical models. These techniques use classical math methods, the newest techniques (like wavelet analysis and its variations), as well as our own technologies (like multiframe spectrum that deals well with choppy financial data). Among them there are some totally new experimental technologies. One of them is "Two dimensional Time-Price distance" charting tool. The basic idea of this tool is incorporating a two-dimensional wave. We used to analyze ONE dimensional waves - the cyclic wave that exists in TIME Universe. Here we try to apply two dimensional wave, this wave propagates through two dimensional TIME and PRICE domain.